Police have arrested and charged a Toronto man in connection with a brazen daylight shooting in the city's west end. Shamoi Palmer, 23, has been charged with first-degree murder in connection with the death of Jermaine George Titus, 32, of Toronto. Officers were called to the Weston Road and Jane Street area on Wednesday shortly before 10 a.m. for reports of gunfire. When officers arrived, they discovered Titus inside a white 2012 Lexus that was stopped in front of a row of houses. He was suffering from a gunshot wound. 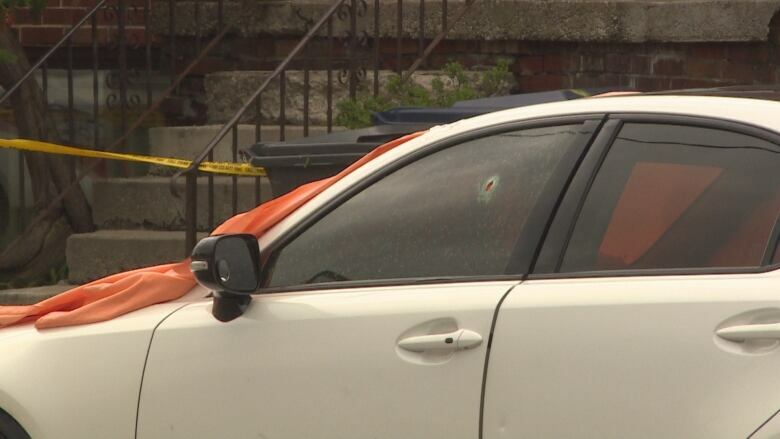 A single bullet hole had broken through the middle of the driver's side window. Police believe the shooting was targeted. On Thursday afternoon, police issued a Canada-wide warrant for Palmer. A few hours later he was arrested as he was leaving a residence. "He was on his way out of the residence trying to get into an Uber at the time," Det.-Sgt. Michael Patterson told CBC Toronto. Patterson says investigators intend to get a search warrant and gather more evidence from the home. Although police are not searching for more suspects, Patterson is not ruling out the possibility that there were more people involved. He is asking the public to come forward with any video surveillance they may have. "If there were others involved we may see them on video," he explained. "It's timely for people to call in and help us retrace the steps." Anyone with information is asked to contact police or call Crime Stoppers at 416-222-TIPS (8477).